Knight’s Low Profile Jib Cranes are ergonomically designed to accommodate workstations where ceiling heights are inconvenient for an overhead crane system. This series offers a large tool coverage area with a single rotating rail on a floor-mounted pedestal. 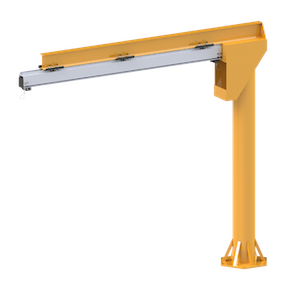 The MJBA2050 is typically used in applications that require light duty tools to be suspended. 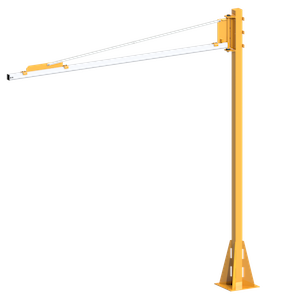 The MJBA2300 and MJBA2600 Light Duty Low Profile Jib Cranes have an adjustable hard stop and a level adjustment screw used to adjust the pitch of the rail. The MJBA3000 Heavy Duty Low Profile Jib Crane allows for maximum hoist height on low headroom applications. Level Adjustment End Bracket used to adjust horizontal boom on rail. Max. Jib Length: Up to 10 ft. [3m]. Max. Under Rail Clearance Height: Up to 12 ft. [3.7m]. Easy (2) Two Piece Installation. Thrust Bearing design Eases Rotational Effort. Max. Capacity: Up to 1150 lbs. [522kg]. For low headroom clearance applications or when an overhead system is inconvenient. Max. Capacity: Up to 2000 lbs. [908kg]. Optional Rail Mounting Kits JSA9130 and JSA9131 are available. NOTE: Capacities over 1,000 lbs [454 kg] require a Dual Load Trolley in applications that use chain or cable. NOTE: Capacities over 1,000 lbs [454 kg] require a Dual Load Trolley.